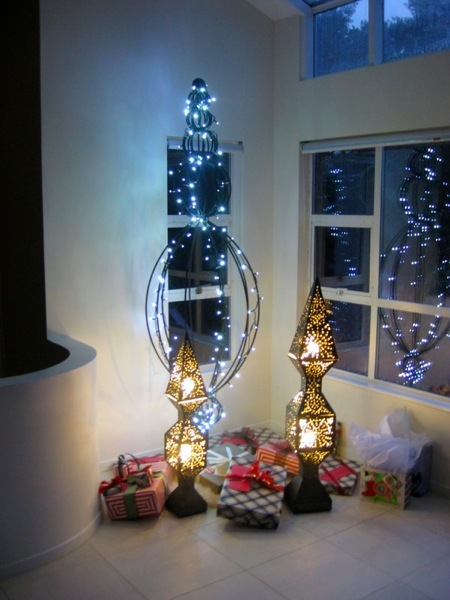 Last year my Mom did a stark, modern take on Holiday decor for her home. Growing up our house looked more like this during December but my mom is the QUEEN of mixing it up. I love that about her. 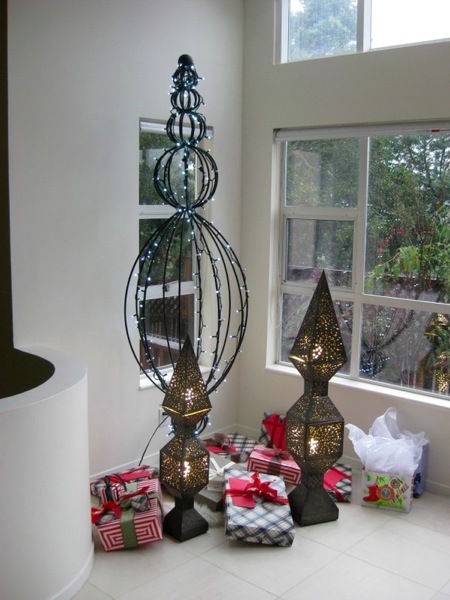 For her Christmas “tree” she wrapped a garden sculpture made by my brother Wyatt in white LED lights that glow an eerie blue shade of the future. 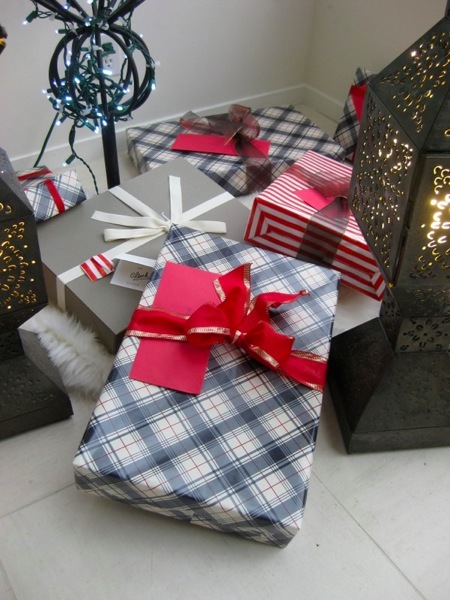 Gifts took on a preppy uniformity by using 2 complimentary wrapping papers (plaid and stripes) and an assortment of bows and ribbons. 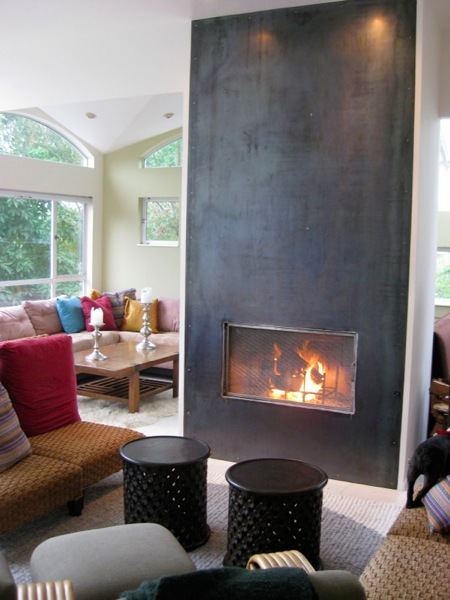 Wyatt had just made this metal fireplace front for her home. 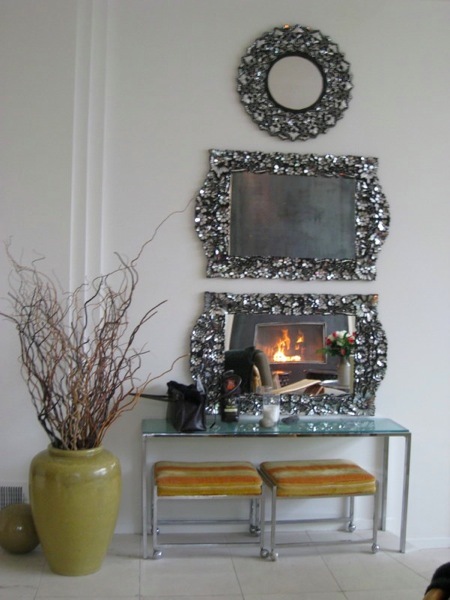 Across the room the fire was captured by a trio of Thai crystal mirrors. Those stools are from my Grandparent’s house in the 70’s, such a timeless style. 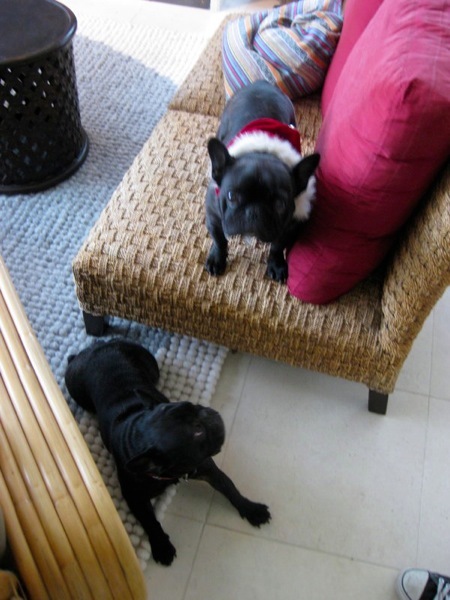 Only one pup is willing to wear the Santa costume, sad. Happy California Christmas! Next week I’ll have snaps from my mother-in-law’s traditional Southern Holiday house, not to be missed. This is really gorgeous! And what a beautiful home and hearth. Way to go Jane & Wyatt! 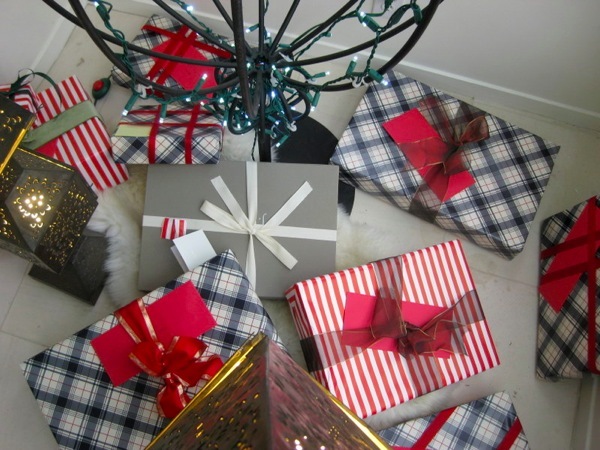 Ummmmmmmmmmmmmmmmmmmmmmmmmm LOVE the wrapping paper. CLASSY CHRISTMAS! That is so great how your mother is able to adapt with the times and enjoy what her children can offer her!!! The fireplace looks so awesome and the fact that the stools from grandparents are included in the scape is really the greatest. I so hope as I get older I can adapt to what my children’s interests are and include it in my daily life, what a blessing. Much more traditional this year for Drew and his California Christmas.